The EU is discussing the possibility of setting up a naval blockade of crisis-plagued Libya. The move could help to control oil exports, stem the movement of weapons fueling the conflict, and prevent the flood of refugees from the country into Europe. “We discussed different options for an EU presence, different ways in which the EU can support also through security measures. This could mean also some naval presence,” European Union High Representative for Foreign Affairs Federica Mogherini said during a press conference after talks in Riga on Saturday. The discussions, including an earlier-debated option of NATO patrols in the Mediterranean, follow pressure from southern EU countries, particularly France and Italy. Last week, a UN panel of experts also recommended the establishment of a monitoring force that would prevent the illegal export of oil in addition to monitoring the arms embargo. The special UN envoy to Libya Bernardino Leon told the Italian Corriere della Serra that he was “certain” the “necessary” mission would be approved by the UN. “There’s a measure that the European Union can take right away: Come out in force to guard the seas off Libya. Italy can’t do it alone. It needs help,” Leon said in an interview published on Saturday. This week Leon has been mediating negotiations between Libya’s beleaguered elected government, and the rival factions who have held control over capital Tripoli, and extensive parts of the country since last year. A UN-imposed embargo has failed to block the influx of illegal weapons into Libya, and the officially recognized government now wants it lifted in order to secure an advantage over rival factions and radical Islamists. During the NATO-backed overthrow of Muammar Gaddafi in 2011, Jihadist groups played a key role, but their influence has grown further. Although the Islamic State affiliated groups control limited territory in the fragmented state, compared to other factions, they been launching audacious attacks on the country’s oil fields and facilities. 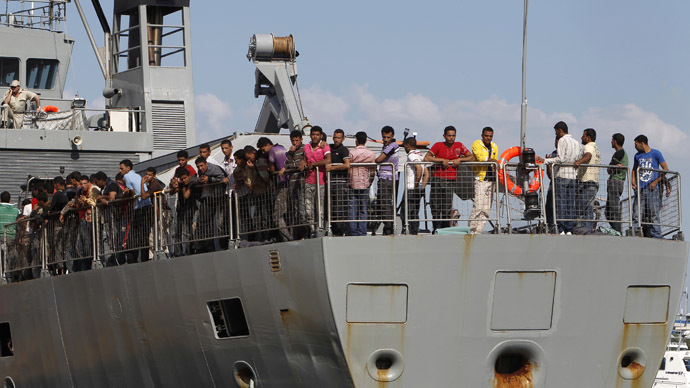 The jihadists of the self-proclaimed caliphate have also expressed intentions to import terrorism into Europe with the daily transports of undocumented immigrants that are launched from Libya’s coast with the intention of arriving in Italy. The number of people fleeing Libya is expected to hit record numbers in 2015. “We have to be ready to address a more difficult situation than last year. According to the sources, we have been told there are from 500,000 to a million migrants ready to leave from Libya,” Fabrice Leggeri, the head of the EU’s Frontex border agency told the Italian news organization ANSA on Friday. Leggeri said that the current provisions “could not cope” with the inflow of migrants. 280,000 illegal migrants entered the EU last year, compared to 100,000 the year before. Any concrete measures are likely to be postponed at least until the internal Libyan peace talks come to a decisive end. “A lot now depends from the success of the negotiations in Libya,” said Italian Foreign Minister Paolo Gentiloni on Saturday.